You have come to the right place if you are looking for fun, engaging and exciting Babies themed activities to do with toddlers, preschoolers and kindergartners. Our activities are widely used by teachers, moms, dads, child care providers and more! Painting with Q-tips and pastel tempera, on small pieces of paper. You can frame their baby paintings on pastel construction paper. Remind the children that when babies color they scribble all over the paper. Do a project like a baby. They will scribble all over a white piece of paper and then paint over with a light wash of black paint. The children are fascinated to see how the paint does not stick to the color but only to the white paper. You do have to remind them, however, to color pretty hard when they are scribbling. But it makes a pretty picture when they are through. Mix the starch and paint together and put a glob of it into the plastic bag. Gently smooth the bag to distribute the paint. Then show your child how to rub his hands over the bag, making swirls, and designs. The fingerpainting can be done on a table or the floor or on a lap tray, if sick in bed or traveling. For a colorful effect slip a piece of construction paper under the bag and see how it changes the color of the paint. 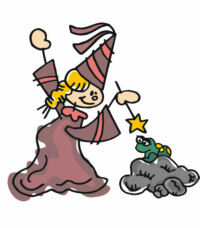 Children think it is magic, and grownups love the no cleanup feature. This is very nice for young children because they get to paint and no worries about them eating it or getting it all over everything. For a group “game” have the children take turns on a medium-sized blanket. The rest of the group kneels around the edge, and together, lifts the “baby” up a few inches, so they can rock the “baby” and sing a lullaby. Good cooperative, peaceful feeling. Have the children bring in their baby pictures and after the children have guessed who is in the picture, have that child come up and talk about the similarities and the differences between the child as a baby and the child now. Then talk about what they can do now that they couldn’t do as babies. This helps them to realize that even though sometimes they feel like they’re too little to do a lot of things, there are really a lot of things that they can do. * How do babies get around? * What kinds of foods should babies eat? * How do babies tell us what they want or need? * What kinds of toys are good for babies? What kinds are not? * What do you remember from when you were a baby? * Any kids with babies in their house can talk about them. 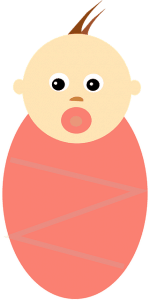 Show the kids different baby items (pacifier, bottle, diaper, formula, newborn clothes, baby wipes, baby food jar, Etc.). Ask children what the object is and why it is needed. Have one of your parents who has a baby bring the baby in. The children will get a chance to watch the mother feed the baby and they can ask her questions about taking care of the baby. Outside, have a station set up to bathe baby dolls. Using plastic tubs filled with water and washcloths, the children will have the chance to bathe a doll and then dry it. Create 2 laminated grids of baby pictures (wrapping paper or greeting cards are good sources). Set out on a table with die or dice and two containers of small baby theme counters (inexpensive plastic diaper pins, rattles, and pacifiers that are sold as party favors for baby showers). Older children may play by taking turns rolling dice and taking the appropriate number of baby items for the babies on their grid. Younger children may just place counters on babies, exploring one-to-one correspondence. That is the way the baby grows. His legs can’t walk, so he must crawl. He drinks from a bottle and naps in a crib. He dribbles his food, so he wears a bib. When his pants are wet, he starts to cry. His mom will change them, so he’ll be dry.